Hindu Temples are the homestay offered to the Gods and Goddesses. They are the structures designed to connect human beings to the Divine. Different symbols and structures used in the temples are extracted from the root of Veda and Scriptures. Mundeshwari Devi Temple in Bihar is believed to be the oldest Hindu temple in India (that dates back to the 4th century) whereas Changu Narayan Temple (that dates back to the 5th century) is believed to be the oldest Hindu temple in Nepal. A temple is built combining different aspects and might be dedicated to one or more deity. Hindu Temples in India, Nepal, Sri Lanka, Cambodia, Malaysia, Vietnam and other western countries that have been growing in numbers over the course of the time. Going deep into the history of temples, it can be revealed that Hindu Temples did not exist during the Vedic Period. The first appearance of temple-like structure happened to be found in Surkh Kotal, a place in Afghanistan. It was discovered by French archaeologist. It was not dedicated to any God but was made for royal clan of King Kanishka (127 – 151 AD.) The tradition of worshipping idol during Vedic period might have brought the concepts of worshipping gods inside the temple. The worship of gods and goddess used to happen in community temples made up of clay and thatched roofs made of straws and leaves. In the certain part of Himalayas or mountain region cave temples existed. It was only from 4th or 5th-century the building of temples started. Then the tradition of building the temple significantly happened between 6th to 16th century. It was believed that building the temple would give an immense bliss and was considered best deed a person could ever do. Thus, Kings, Saints, and other rich people would build temples to perform the various religious activity. No one exactly knows about the oldest Hindu Temple, but Mundeshwari Devi Temple in Bihar is believed to be the oldest Hindu temple built in Nagara style. The temple is dedicated to Shiva and Shakti. There are many temples that date back to 6th century built by Pallavas, Chalukyas and Rastrakutas dynasties of South India. We see some complex architecture and designs of Temples but seldom think how they were even possible to be built? Mostly, the answer is Vastu Shastra. The architecture of Hindu Temples is basically based on the Vastu Shastra. Vastu Shastra is the texts that contain the information about design, layout, measurements, ground preparation, geometry and space arrangements. It provides the procedural rules and directions for the design and layout of the buildings. 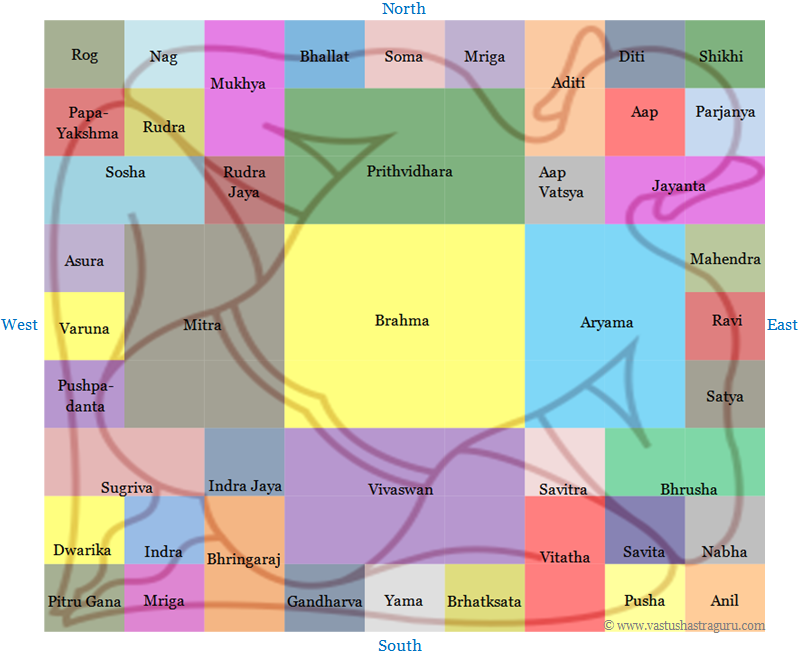 At first, the plan is made in the form of geometric design called Vastu-Purusha-Mandala. Vastu meaning dwelling, Purusha meaning universal essence and mandala meaning circular. Hence, Vastu-Purusha-Mandala is symmetrical, self-repeating structure based on the Hindu texts, cardinality, and mathematical principles. The circle of the mandala represents the square and then the square is divided into 64 or 81 divisions called Padas. Some symbolic elements or deities is assigned to each Padas. Beneath the Mandala’s square, there is a space for Garbha-Griya i.e. Universal spirit, the Purusha. Above the Vastu-Purusha-Mandala we often design a dome-shaped structure called Shikhara in north India, and Vimana in South India. The Shikara faces towards the sky. The religious reason for the dome shape is the use of Namaskara gesture which is considered highly divine. For building the Fractal structure, where similar patterns recur progressively following method is used: A method of measurement called “Tala” is used to define the dimensional relationship of proportions. The Tala system is believed to be scale invariant. So, using this system building of any size can be built and decorated. By blending fractalization processes with repetition and superimposition the temple is built. Temples are the dwelling place of God so it is believed to be the place to receive blessings from God. The one who regularly visits temples gets God’s grace and spiritual power. The prayers and chanting done inside the temples create peace of mind. 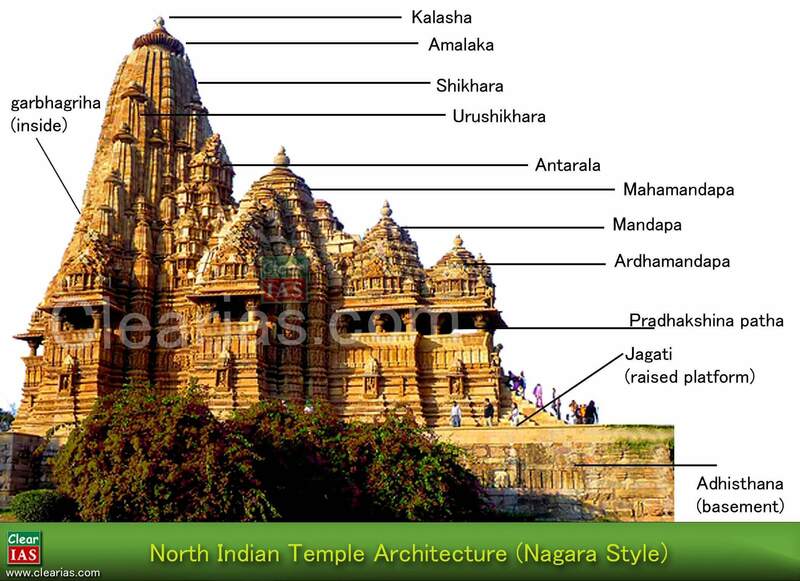 The outstanding architecture of Hindu Temples signifies the arts, values, and ideals of Dharma of Hindu Religion. Temples are built on the ground of Vastu Shastra. A devotee is not allowed to put shoes or any footwear inside the premises of the temple. Ringing the bells of the temple gives one immense positive energy. Namaskara mudra is used to greet gods inside the temple. A lamp with oil is lit to gods and goddesses. Making three rounds around the temple or main idol activates one’s senses.